With a flight in the early evening, we decided to spend the last day exploring Funchal’s hills. We strolled through the narrow sun-drenched streets to the sea front, taking photos of the colourful painted doors (some much more tastefully assualted than others), and sat down for a while on the promenade wall taking in the colourful sight of the town and the beautiful green hills behind. We took the Monte Cable Car, a spectacular 15 minute ascent to Monte, and the sweeping vistas of Funchal, the sea cliffs and the endless Atlantic grew more and more breath-taking. There are plenty of things to do once up in the small village of picturesque Monte. 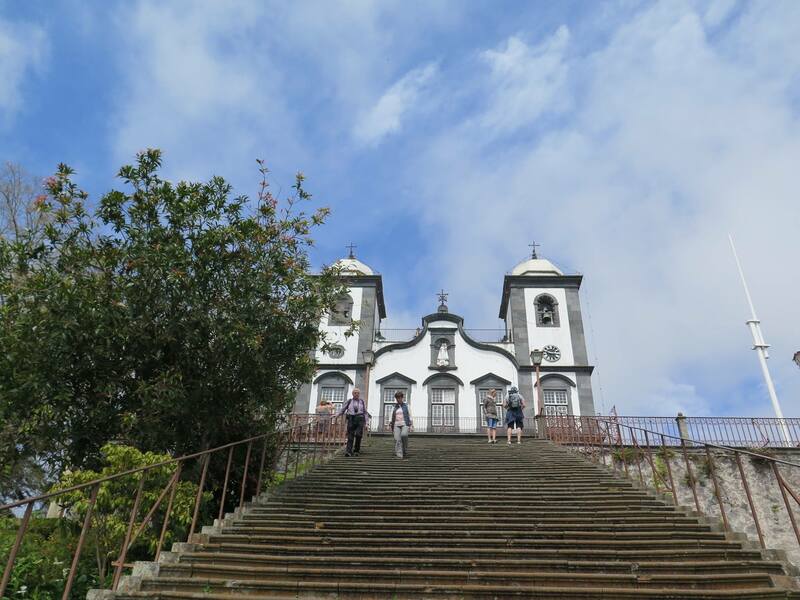 You can visit the Monte Palace Tropical Gardens, the pretty Madeira Botanical Garden, and the lovely church of Our Lady of Monte. Strolling the pleasant surrounds, and gazing over Funchal and the ocean, you can see why this place was formerly a health resort for Europe’s high society. We saw a lot of young men wearing white cotton clothes and straw hats promoting what has become symbolic with Monte – the toboggan ride. 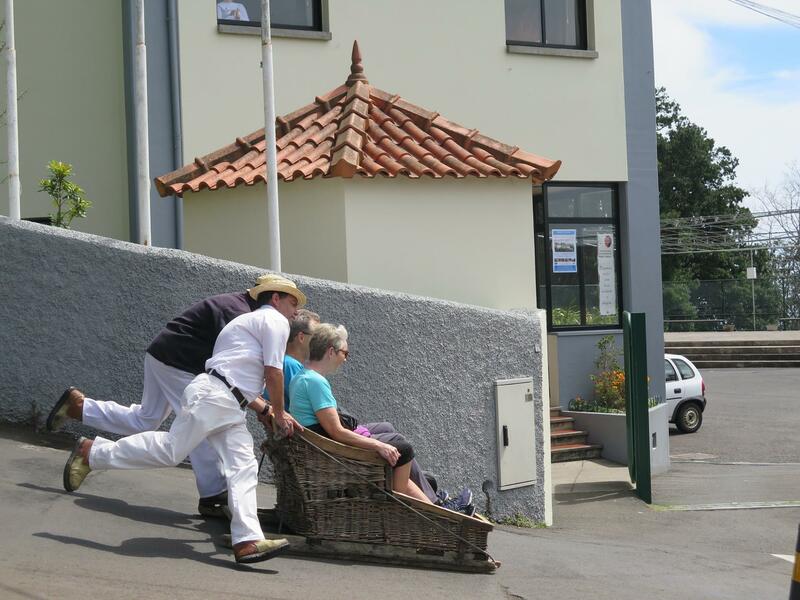 Originally for the people of Monte to get down to Funchal quickly, these two-seater wicker sledges have become a major tourist attraction. At the cable car station one can purchase a cable car ride up, and a sledge down, which saves about 4 euros off the normal price. On a tight budget, we were unable to experience the ride ourselves, but got to watch the quite hair-raising rides from the bottom of the first hill they come down. Two men work to push the sledge down the hill, and then use their rubber-soled boots as brakes. When there are women sitting in the sledge, I noticed, the young men push particularly hard, showing off their speed and strength, and perhaps even winning a date in Funchal later that evening. The sledge route is made the more exciting and, dare I say, dangerous, by the fact that the route used is the same route used by all the traffic going down to Funchal. There are men who act as spotters at key points, however, to warn or stop traffic. It’s a 2km route. That’s about 4km shy of Funchal. Enterprising taxi drivers wait at the drop off point and charge a premium for whisking overfed tourists down to Funchal, while leaner souls stroll down and enjoy the fresh air and the views in the hills a little longer, before they get to the oven of Funchal. Vero and I took the cablecar back down, had an ice-cream stop, then strolled to the colourful Farmer’s Market (Mercado dos Lavradores). Here, you find incredible exotic fruit stalls, and can sample 7 different types of Passion fruit: tomato, banana, strawberry etc. Madeira is blessed with an exceptional climate for growing fruits, and as such there is an absolute wealth of it available all over the island. It’s a small but vibrant market, and, though clearly a tourist trap, is still a great place to see the delicious highlights of Madeira’s fruit, vegetables, nuts and seeds, and of course beautiful flowers. We had a pot of tea in one of the attractive cafes upstairs, which offer pleasant alfresco seating, then we headed back to pick up our bags and wait for the airport bus to take us on the scenic route to the airport from which we would fly to the less favourable climate of Porto. Madeira is the perfect place to spend a few days….and we will definitely come back to explore more.